Hello everyone. 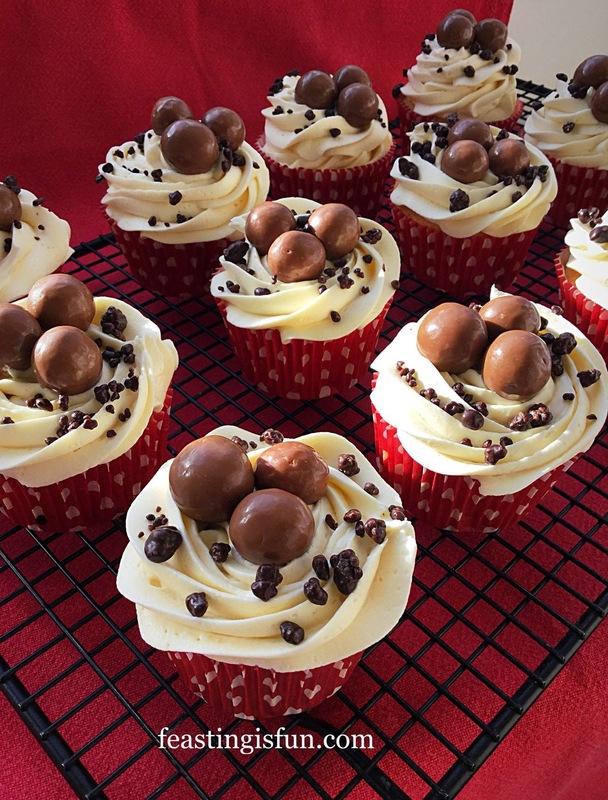 I have THE most amazing recipe to share with you all today. 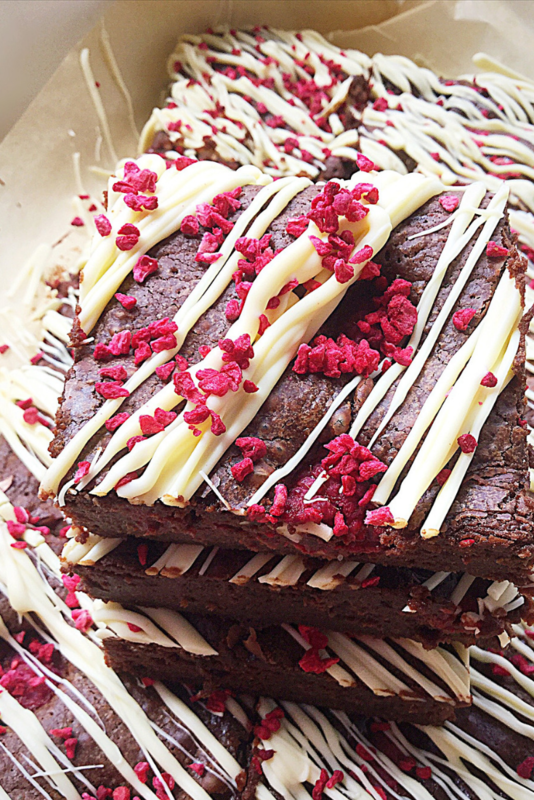 Not only do these Rich Raspberry Chocolate Fudge Brownies taste incredible, they can also be made gluten free. Yippee! I absolutely love creating recipes that can be enjoyed by more people. Also, this brownie recipe has an added, optional boozy ingredient. Yet, as always this can be left out so that children and those who don’t or can’t have alcohol can also delight in these brownies. Brownies are one of my favourite bakes. And lately I’ve been experimenting with various additions. It is important that the resulting brownie delivers both flavour and that damp, slightly squidgy texture that qualifies a true brownie. Yet I’ve found the addition of other ingredients can create a fantastic, taste bud treat, such as these Chocolate Fudge Double Hazelnut Brownies. Since I know that raspberries and chocolate are a great flavour combination I decided to try it in a brownie. Oh wow. I was totally unprepared for how incredible the result was. As soon as the raspberries start to bake into the brownie batter something incredible happens. While exposed to the heat of the oven the raspberry flavour intensifies. 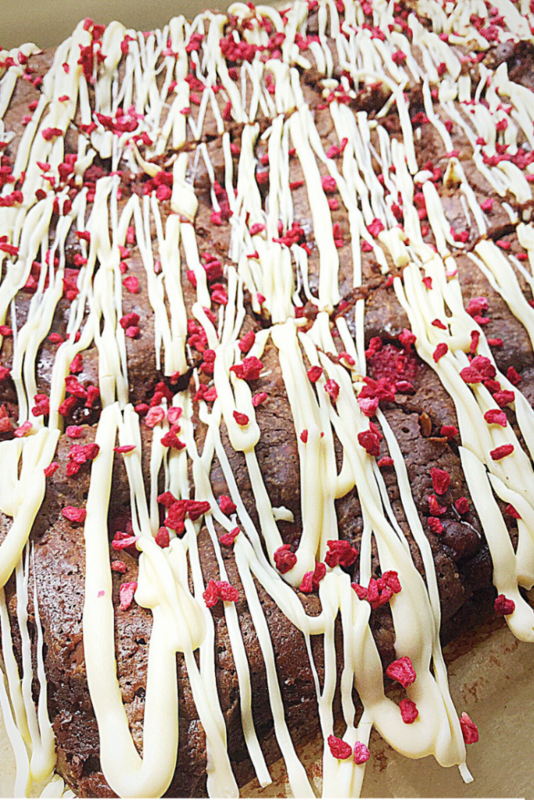 Also the raspberries merge with the brownie so that they become as one. With the addition of raspberry liqueur the final taste is raspberry and chocolate heaven. 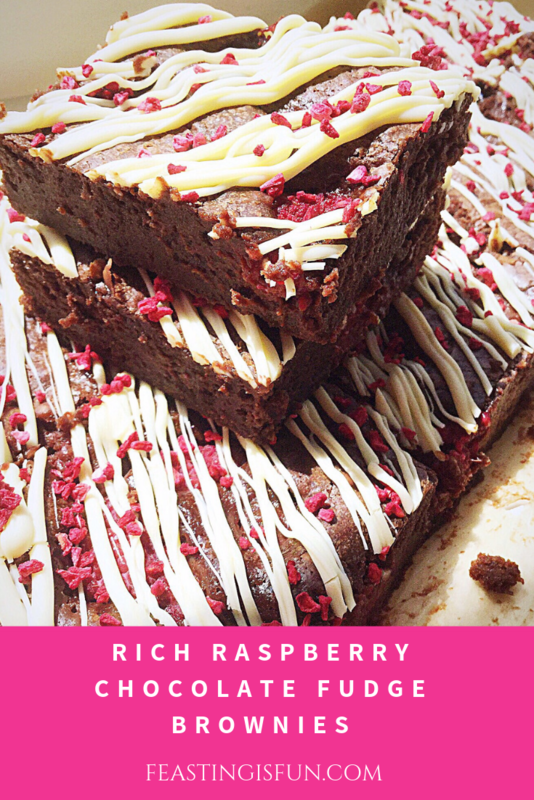 Since the raspberries also add to the fudgey texture, creating a ridiculously good dessert. 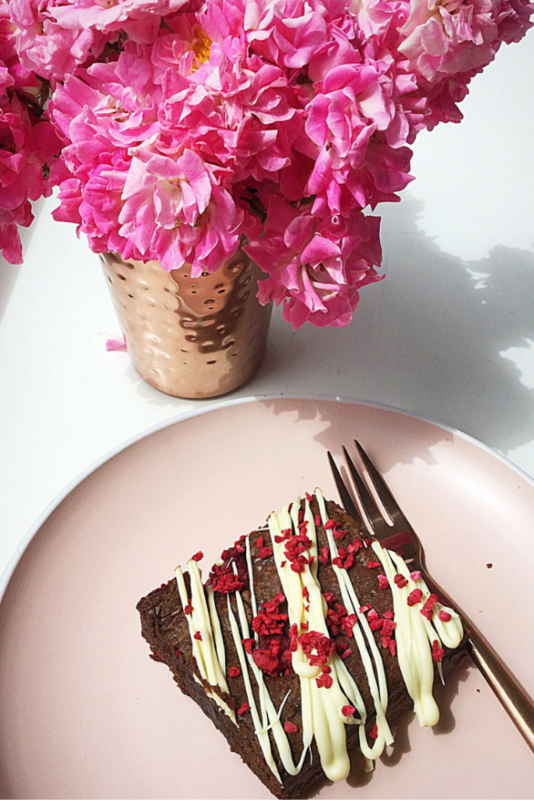 If I were to serve these brownies at a dinner party I would top with fresh raspberries and a generous scoop of the very best Vanilla Ice Cream. Also I would warm each brownie for 10 seconds in the microwave. Doing so further awakens the combination of flavours. You will need a 22.5cm x 30cm (9” x 12”) deep tin, lined with baking parchment or tin foil. First of all break up the chocolate and place into a heatproof, microwaveable bowl with butter and salt. Microwave on medium power for 30 seconds, stirring in between, until the butter is melted and the chocolate has started to melt. Remove from the microwave and stir continuously until all of the chocolate has melted and combined with the butter. Set aside to cool. Weigh the sugar into a large jug, add the eggs, vanilla extract and raspberry liqueur (if using). Using a fork stir to combine the ingredients. 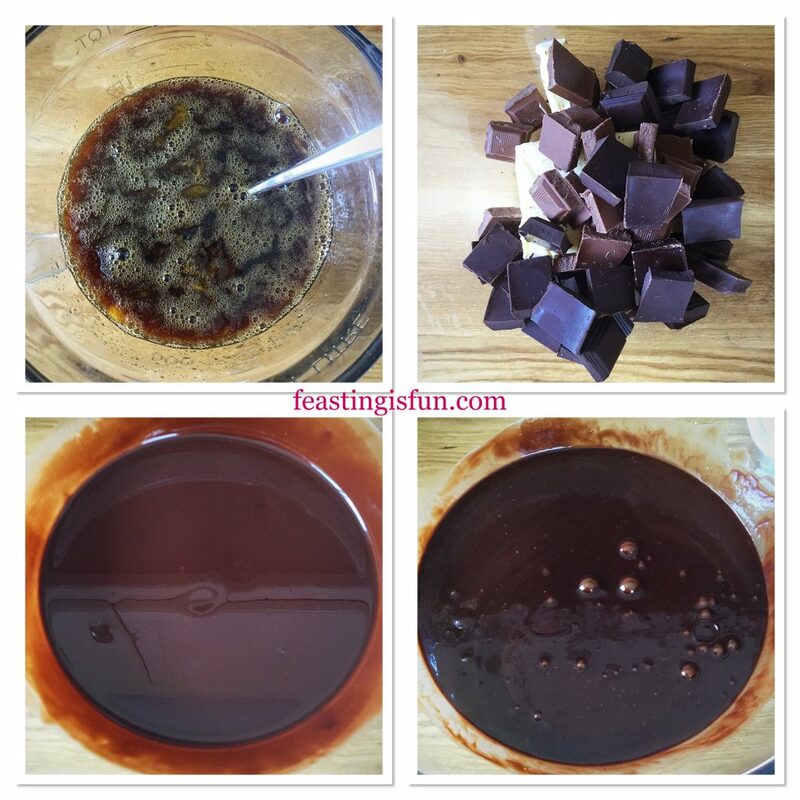 As soon as the chocolate has cooled, pour the egg/sugar mixture in stirring constantly. Add the flour and stir into the chocolate mix. Finally add half of the raspberries to the brownie batter. Stir carefully to combine. Pour the brownie mixture into the prepared tin. Finish by adding the remaining raspberries evenly to the top of the mixture. 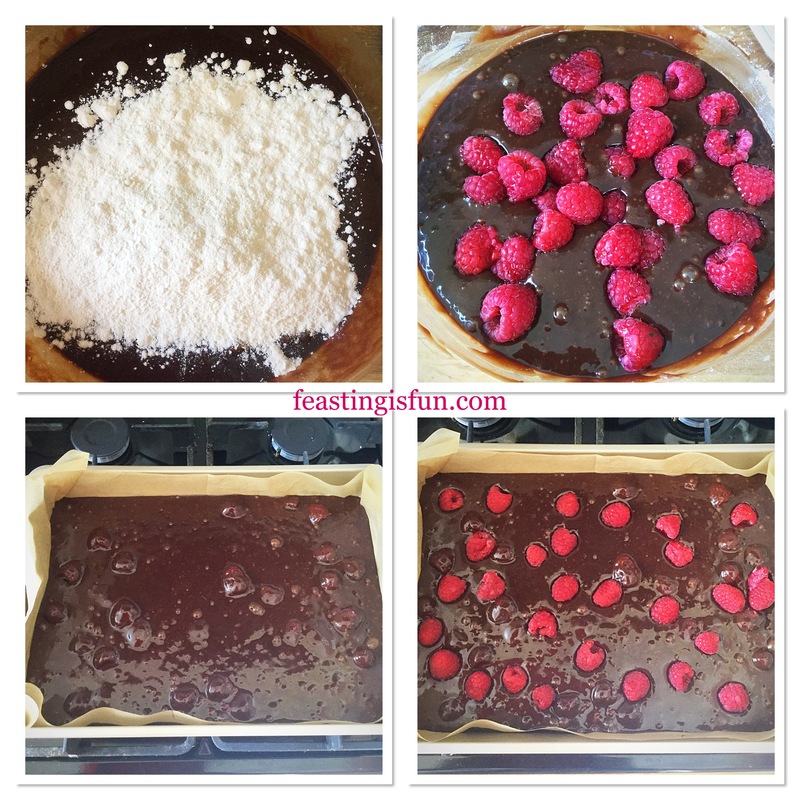 Adding fresh raspberries into the batter and on top of the traybake. Place the tin into the centre of the oven and bake for 25-30 minutes. Halfway through the baking time open the oven and using gloves rap the brownie tin on to the shelf a couple of times. Doing so helps to release any air bubbles formed during baking. Resulting in dense, fudgey brownies. The brownies are baked when the surface is shiny, with a slightly crackled appearance. Also, there should be a very slight wobble to the centre of the bake. As soon as the brownies are baked remove from the oven, leave to cool completely in the tin. As soon as the brownies are cooled lift them out of the tin, using the baking parchment. Pull out the sides of the parchment so the paper is flat. Break up the white chocolate and place in a heatproof, microwaveable bowl. Zap for 30 seconds at a time, stirring in between. 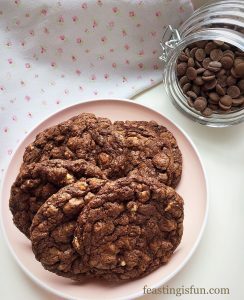 As soon as the chocolate starts to melt remove from the microwave and stir continuously until it is completely liquid. 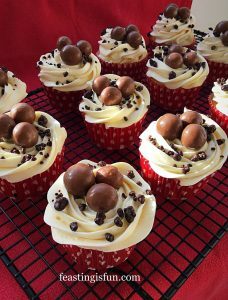 Pour the melted chocolate into a disposable piping bag. Snip the very end of the bag leaving a small opening. Starting at a corner drizzle white chocolate in a diagonal pattern over the brownie slab. 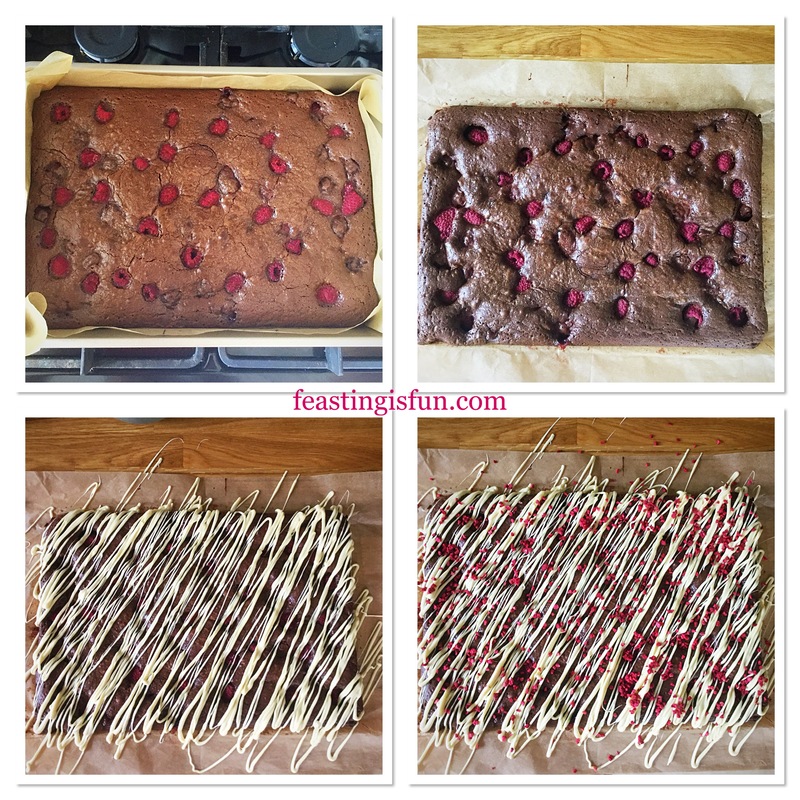 Sprinkle over freeze dried raspberries so they stick to the melted chocolate. Cut across the width at 3 even intervals, wiping the knife with a cloth between each cut. Follow by cutting vertically down at 5 even intervals. Resulting in 15 brownies. Serve chilled with a glass of something sparkling. 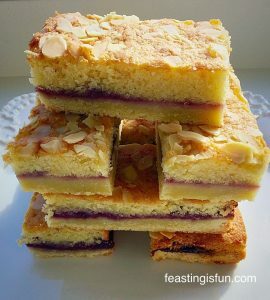 Alternatively, warm as mentioned and serve with ice cream. 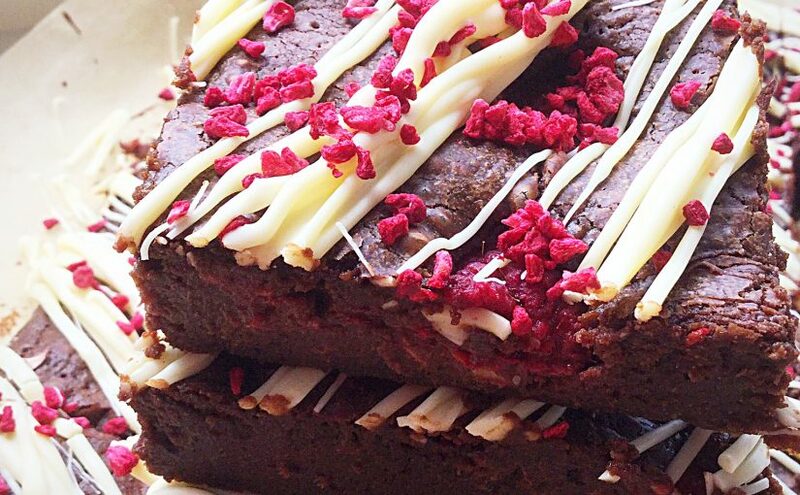 However you enjoy these brownies they will taste better when shared! We have experienced a very warm start to the Summer this year and I haven’t wanted to have the oven on. Yet, when I’m baking brownies, it is such a short baking time that I haven’t minded. Similarly, meringues bake at a low oven temperature, so why not try this Raspberry Chocolate Pavlova? Finally why not try one of the many ice cream recipes here on my blog? It is so much fun coming up with new and delicious flavours! I hope that whatever you are making, baking and creating in your kitchens, you have fun preparing and sharing your feast. No part of this post may be reproduced or duplicated without the written permission of the owner. Please see my Diclosure Policy.